It’s been cold and rainy all week. In New York I knew how to deal with the rain, had no choice. But there I had proper rain boots, an underground train system to transport me through the dry belly of the city, more than one umbrella. Here, in Be’er Sheva, my wardrobe is now suited to the desert I live in. When it rains it takes all my energy to get out of pajamas, let alone leave the house. But therein lies the beauty of working from home – I don’t have to! And on days – more like weeks – like this, I crave warm, comforting dishes that I can curl up in. Yes, I literally mean curl up in. The other night, freezing in my poorly insulated apartment, I told my husband I wanted to make a stew just to bathe in it. I was only half kidding. So where does this salad fit into the picture? Well, after eating the kind of heavy comfort food that this weather inspires, I do a 180 and crave light, nutritious salads to balance the rich, wintery meals. I want to be reminded that brighter, warmer weather is around the corner. I want to be transported, at least for a moment, to a sunnier place. I still need my salads to be filling (not like in the sticky heat of summer when watermelon seems the only appropriate food). This salad with fruit, nuts, cheese, and a tangy pomegranate vinaigrette does the trick. I originally developed it for my Sukkot menu over at the Jew and the Carrot, but I find that it’s still just as appropriate and seasonal now, at the beginning of February. Feel free to swap whatever fruits and veggies are available near you now and suit your taste. I love everything about this salad. I love the different textures here, the play between savory and sweet, and the mix of fresh and dried fruits. It sings of this region with its dates and pomegranates, both in different forms here (pomegranate seeds in the salad and juice in the vinaigrette; dried dates in the mix and date honey in the dressing).Even the dressing feels like something special. It’s slightly sweet, but mostly tangy in the way a good vinaigrette should be. I hope you enjoy it as much as I did! This salad is a delightful mix of fresh and dry fruits, creamy goat cheese, and tangy pomegranate vinaigrette. It makes a nice light supper as well as a superb - not to mention beautiful - side. Put all the ingredients in a salad bowl. Toss with pomegranate vinaigrette (recipe below) or serve on the side. Combine all the ingredients in a food processor, or vigorously whisk together by hand. Gluten free, Kosher dairy, Vegetarian Note: to make vegan or parve, simply omit the goat cheese. Oh wow, this has all my favorite ingredients! 🙂 How I love goat cheese with fruit! The vinaigrette sounds like a fantastic complement, too. Thanks Kiri! I also love the combination of goat cheese, fruits, and nuts. You did make some pretty awesome choices of ingredients here-yum! This is a recipe that you know there will not be much clean up. Every serving of this salad will end with a bowl scraped or licked clean. Tasty post! I agree that after eating so many comfort foods to stay warm, it’s nice to have a filling salad. The cold makes salads hard at times, but with a salad like this one – it wouldn’t matter! I love all of the fruit, fresh and dried! Fantastic salad and a delicious vinaigrette! Thank you MJ! I know, I definitely don’t always crave salads this time of year, but I like to break it up! Beautiful salad! And congrats on top 9! Great combo of flavors. And I know what you mean about craving something with greens after a lot of heavy food. I often wonder if it’s not the acid in the vinaigrette I’m really wanting? Who knows? Who cares? Just bring on the salad! Really gorgeous color in this salad. Anyway, good recipe – thanks. Thanks! I think you have a point about really craving acidity. OMG I would die for this salad for lunch right about now!! You temptress!! Katherine, this is my kind of salad, just divine. Thanks for sharing. I am a fan of all sorts of salads. This looks delish! What a lovely looking salad,yummy! What a delicious salad, Katherine! I love every single ingredient! Excellent!! I am so happy to hear it! It really is a great combination. This salad sounds and looks delicious! I like all kinds of salad, but there are few that I particularly like. This kind of salad is one of them. Dijon in dressing is nice – I like that. I’ve tried using pomegranate a couple of times but I never made dressing. This has to be a keeper! So happy you like it Nami!! I always love a little Dijon in my vinaigrettes. I find it helps to thicken and flavor it. I will have to try this salad. Looks stunning. The colors and flavors are superb! Thank you Asmita! I also love the colors, makes it so much more appealing to eat! A very delicious and healthy salad. It has all my favourite ingredients. It has been raining and cold here all summer, I’m currently wearing uggs – ugh. The salad however sounds lovely and delicious! Oh no! And in the US apparently they are having a very mild winter. Oh well, luckily this salad is good no matter the season! 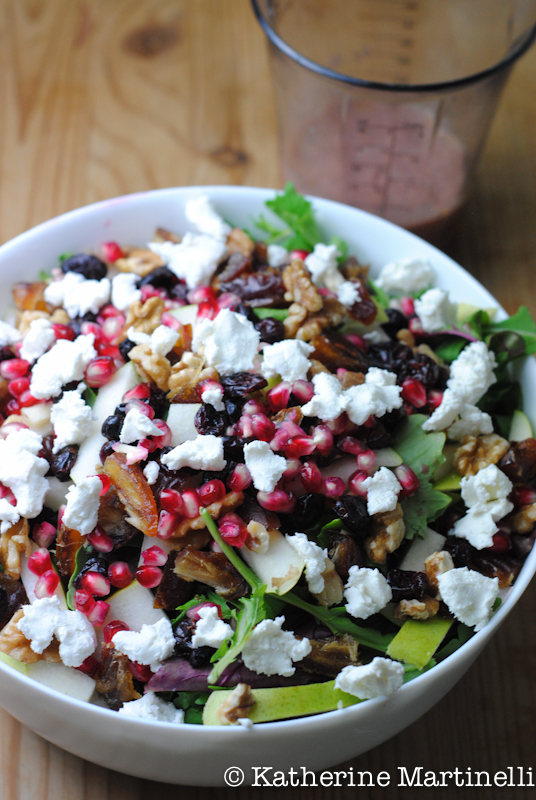 I love the combination of flavors in this salad Katherine, you cant go wrong with fresh cheese, greens and pomegranate! It looks lovely! Thanks Carolyn, me too! Yes, this would make a perfect lunch indeed. The sweet and tart of this salad is calling to me. What a nice combination; for any time of the year! Winter is actually my favorite time of year to eat salads because I crave the bright colors and the feeling of warm weather that eating them gives me! Fabulous! The picture says it all..
Mmm, what a delightful combination of flavors and colors! I could happily eat a large bowl of this right now. I hope the sun comes back soon! I tried this because I’ve been looking for the perfect pomegranate vinaigrette. Didn’t have any red wine vinegar so I used balsamic instead and skipped the sugar (since balsamic is so sweet). Loved the salad, never had dates in a salad before but it worked really well, I also liked the variety of fruit. I skipped the goat cheese, it’s fine without it. The perfect balance, I absolutely loved every bite!! Oh yay! I am so happy to hear that.